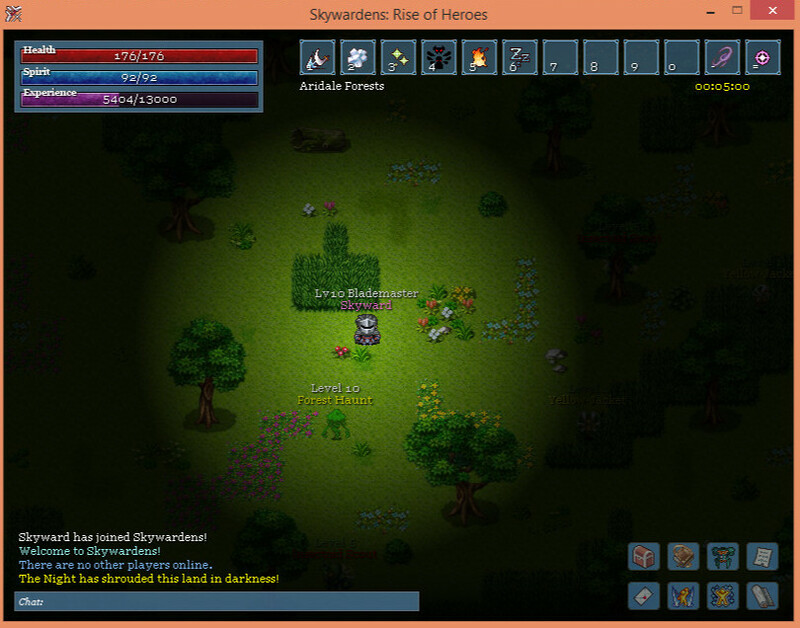 Skywardens Rise of Heroes is an exotic ORPG in which the players decide the fate of the realms. It is strongly centered around story, setting, and exploration. Supported by an ever-growing community, this game can see it’s goals and will not hesitate to reach them. What makes Skywardens Rise of Heroes great is it’s creativity and originality. The game takes place on a series of floating ‘islands’ named Sharda. These islands are part of the core game mechanic, accompanied by the addition of flying an airship, the world of Sharda is sure to leave you wanting more! What kind of ‘living’ game wouldn’t have these? The world of Sharda will grow and adapt based on player’s actions! At Skywyre we have a standard depending on the game we’re making. For something of this caliber, we’re going to try to be as professional as possible! The general story of Sharda/Skywardens is long and complex. Make sure you’re comfortable before starting! An event, known only as ‘The Shatter’ changed Earth forever. This cataclysmal event split the earth into groups of floating ‘islands’, huge landmasses that flew through the air before eventually finding a somewhat permanent place. The people who survived this catastrophe called the new world Sharda. Writings from this period in time claim that the Shatter was an attack. This was dismissed as heresy and most of these records were burned. Several hundred years after the events of the Shatter things have quieted down. Science has altogether but dissipated and was cast down by almost all of Sharda, as they believed it the cause of the Shatter. Magic slowly crept back into the world and with the reality of the new living conditions brought rise to fantastic Airships that were used to travel from island to island. Mutations, a side-effect of chemical disasters that had taken place on the planet before the Shatter, slowly began to change several populations at a time into completely new races. These new races soon began to create cultures of their own, and were soon recognized as Free People of Sharda. During the rise of this new world, several Kingdoms began to rise from the ashes of civilization. Among these Kingdoms, two quickly begin to emerge as the leading powers of Sharda. The Ursan Kingdom, a great people that were among the first to create Airships. Their peoples are adept at arts of literature and music. They seek the peace of their lands and are constantly fighting off terribly destructive monsters. The Nyroc Empire, a powerful nation with an imperial mindset. The Nyrocians are responsible for loosing monsters back into the world and, while not all Nyrocians are the same, they are infamous for their continued line of maniac Emperors. Upon it’s appearance, all wars ceased. The scholars took this as a sign that the Dawn Sentinel was a holy being and was to be sought out for it’s wisdom. Unknown to the peoples of Sharda, the Dawn Sentinel was actually a Hive Mind of a race called the Dishalathi. It was the Dishalathi that attacked Earth so long ago, causing the Shatter. Masters of deception and with many shapeshifters among their dying ranks, they were easily able to infiltrate to positions of power amongst all of Sharda. The Dishalathi are dying. For too long have they been feeding off the life-forces of other worlds. They seek a permanent home. The Dishalathi have made a grave mistake, however. They grant noble heroes of the realm the gift of the Sky. They become ‘Skywardens’ and are charged with the protection of all of Sharda. Created to balance chaos while the Dishalathi try to silently gain control of all Sharda, the Skywardens have free wills, not connected to the Hive Mind. While the leaders of the Order are still in the pockets of the Dishalathi, the new recruits to the Order have begun to question the order of things. With betrayal and deceit in every corner of Sharda, and the Dishalathi secretly taking control, there is only one last question. This is where the player comes in! Want more lore? Head over to the ‘Sharda’ board at our website! We have more features planned! If you cast ‘Fire Torrent’ enough times, it level’s up! Almost every single spell/skill in the game has 3 or more progressions! I’ve completely fixed quests for a DX8 Engine and you will be thrilled by some of the quests you will encounter! I’ve created a unique stealth system for Skywardens. While in stealth, you are invisible to AI and you are rendered as semi-transparent. If you attack before your alotted stealth time is up, you are automatically un-stealthed and deal bonus damage. We can now re-color nearly any graphic through the editors and the color values will be saved. Pretty nice feature! NPC’s can shoot projectiles at you and can also cast some nasty spells! With additions like Blind, Silence, and Stealth spells, you’re going to absolutely DESPISE some of the more challenging bosses. It also makes it MUCH more rewarding when you defeat one though! I’ve made a new system for handling Elements. Now 1 element has a variety of strengths and weaknesses! A fully functional Guild System with a new sleek interface! Items now have a weight and your character now has Stamina. The more weight you have on, the slower you move. Slow movement can mean DEATH. Upon reaching level 10, you will be given a choice of which class to advance to. My new NPC Spell System preforms well and is unparalleled in nearly all Eclipse Based titles. Players and NPCs can now have Allegiances. Depending on your Allegiance, NPCs will choose not to attack you, or attack you even harder! Of course there are more than these, but I highlighted the main points I think players will enjoy most. So! 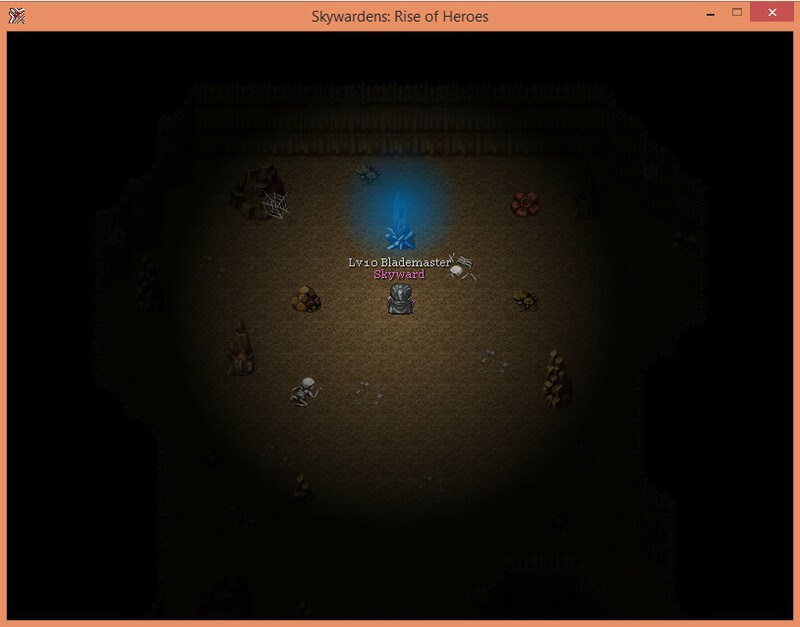 As you can read in the chat of that picture, Skywardens: Rise of Heroes is a go! Be sure to check out what’s going on by visiting this thread every so often. If you have any questions about the Engine, Project, or me, go ahead and shoot em over to me via PM OR by posting them below. I’m really looking forward to sharing my process of making a game with all of you. I feel as though some people here need the little bit of extra assistance to motivate them to finish their games, so from now on I’m going to post daily updates on what I’ve done that day. Hopefully this can create a base template for how developing a game should be handled. I’m aiming for an Open Alpha that will last for about a week starting September 30th. I’m going to try and get everything I want for Open Alpha 1 done a week prior to release. This way I have a week to go through and polish everything and check for bugs. That’s all the info I’m giving for now. I’ll try to do my daily update tonight. Stay tuned! So, this week, from yesterday to Monday, is all about planning and Engine Polish. Yes, the Skywyre Engine has no bugs (that I can find) but it’s still important get those nice little touches in here and there. Do I want consume items to disappear from the hotbar when used? Just how orange do I want the dawn to be? Are the idle animations rolling out too quickly? Is my stat to spell vital scaling balanced? These fine little details matter to me, as they should matter to each and every one of you here making a game. If your game goes without these little details being finely etched in, the end product feels rushed and unmemorable. So yes, engine polish is VERY important. Planning is also a very important step in making a game of this caliber. You can’t just go making npcs and maps willy nilly! NO! You need to plan it. Okay so, the player starts here, get’s some story/lore, then is sent over here. What enemies do I want here? What should the environment feel like? What mood should the music be? Things like these require some thought. Sometimes only a little, sometimes MUCH more. If you’re making a game currently, be sure to always plan. This, along with all the optimizations and polish I’ve added to the Engine in the last few hours, is a terrific first day for Skywardens - Rise of Heroes. This is exactly what I’m NOT trying to do. In Rise of Heroes, you’re not the main character, merely an onlooker that can choose to do what they wish. So, I kinda dropped the ball. Got so wrapped up in school and work and developing the game that I forgot about the whole “Daily” update thing. Also added a TON of polish to the engine as well as introduced a few new features! Feel free to ask questions, I’m always around and will answer to the best of my ability. Why focus on quantity when you need quality? It’s a common mistake ppl do here, instead focusing on how many maps and mobs you have done, you better focus on the quality, how well it’s the game working and how fun it is. By fun, I don’t mean beautiful maps and dialogue jokes here and there, I mean something that will keep the players interested, active and still enjoying the game instead keeping the player just for the curiosity before criticising but keeping them bored. Every fresh mmorpg starts with little content, some of them well packed others less and boring. You should have for the start a nice well packed content, instead having large content but like crap. It’s much easier to manage a small well made content, and it’s much easier to balance and see if it’s worth continuing/releasing the next expansion. I can totally understand. I should have mentioned this in the update post, but I’ve put at least 22 hours of development time into the game already. With every item or spell or map I make, I spend quality time to test them thoroughly, making sure they’re balanced and what not. Balance is one thing, gameplay quality is a must. You can hide the GUI at ANY time by simply pressing the H key while out of chat. This allows a much more immersive experience and can really come in handy when the UI just seems to be getting in the way. Just an announcement, I’m shooting for a Closed Alpha release of Oct. 5th. This coming Saturday. More info is on the way as well as a more detailed project page and video! Diggin the screenshots, looking forward to this! I’ve updated the project page. Closed Alpha begins sometime in the next 12 hours! Remember to join us at Skywyre.net for more info and a kickbutt community. Nice project u use prospekt engine?